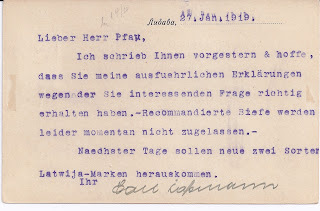 This Blog was made possible by the recent sale of the Dr Hubert Schrödinger "Baltica" collection at Heinrich Köhler, Wiesbaden. 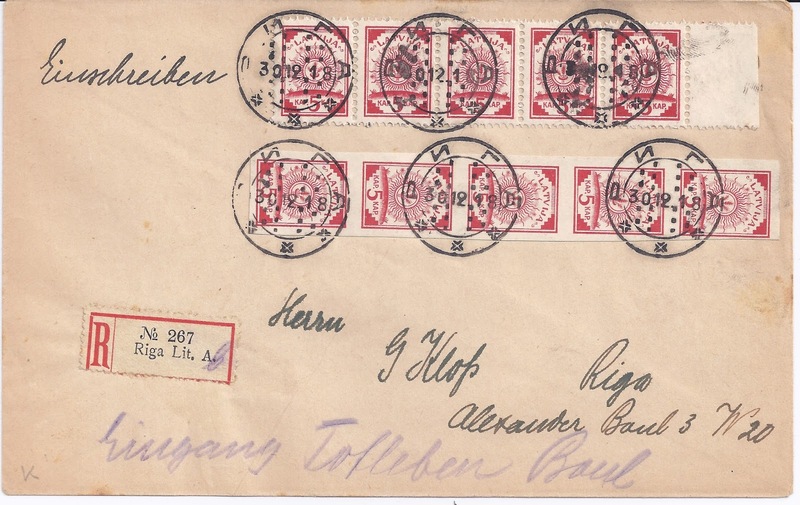 Latvia's Map stamps of 1918 are well-known, well-studied and widely collected - quite often, in complete sheets. There is a very good website devoted to them at www.apsit.com. I have used Bill Apsit's site for some of the information below. 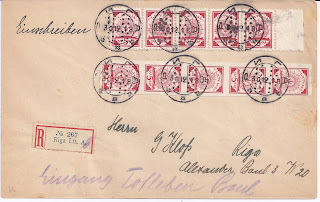 They were available at post offices but for a very short time period - and most of the people at the post office counters appear to have been stamp dealers or collectors. Here is a brief Chronology. After Germany signed the Armistice with the Allied Powers on 11 11 18, Latvia quickly proceeded to declare its Independence on 18 11 18 - though German troops and administrators remained in Latvia until late in December. The Latvian government in Riga took delivery from the Riga printer of the first instalment of Map stamps on 17 December. 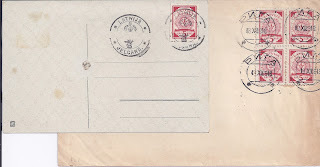 The first illustration below shows a blank philatelic cover cancelled 18 12 18 but this is unusual - most Riga cancellations on Map stamps are dated for the last five or six days of December. Then the trouble begins. The Latvian Government evacuated from Riga on 2 January and on the 3 January, Soviet Latvian troops entered the city. End of Map stamps in Riga. 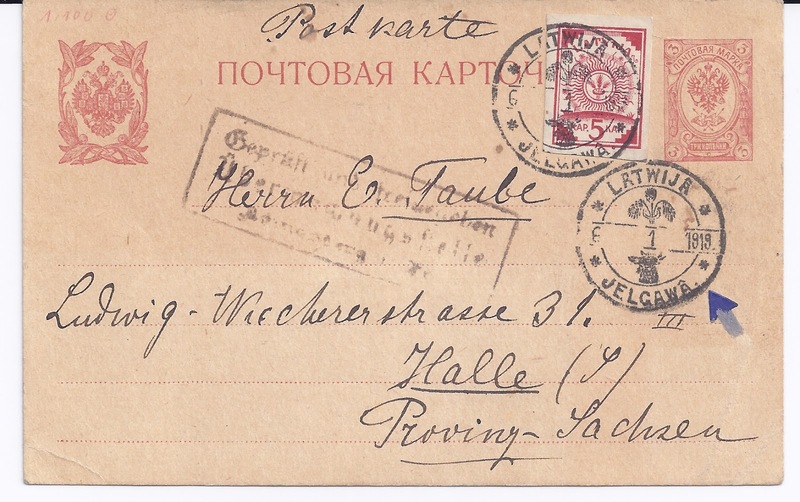 The government evacuated first to Jelgawa (Mitau / Mitava) and then to Liepaja (Libau, Libava).It returned to Riga on 22 May 1919 and took delivery of more Map stamps (which may simply have been kept in store during the Soviet occupation). But it seems doubtful that these new supplies were issued. So if you are looking for postally used Map stamps, then for Riga they will only be found in a 14 day period from 18 December to 1 or 2 January. After that, they can be found from other cities and towns - but rarely - and they were soon replaced by further issues with a wider range of values - the Map stamp only exists in one 5 kopeck denomination. These unaddressed items are not so common - either they had addresses written in soon after or they were "harvested" for used copies of the Map stamps and so no longer exist. So it seems clear that these ordinary letters travelled. 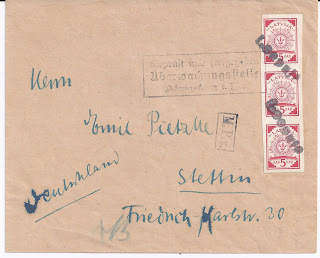 At this period, people often used Registered letters to maximise the chances of a letter arriving - but as we shall soon see, this was not possible at the end of 1918 - beginning of 1919. 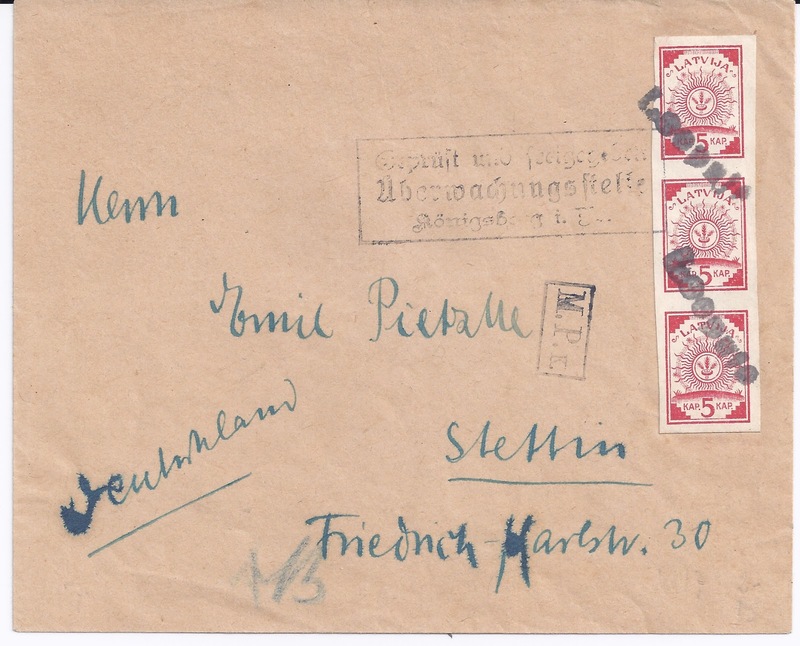 The two letters above can be reckoned both genuine postal uses and very scarce. 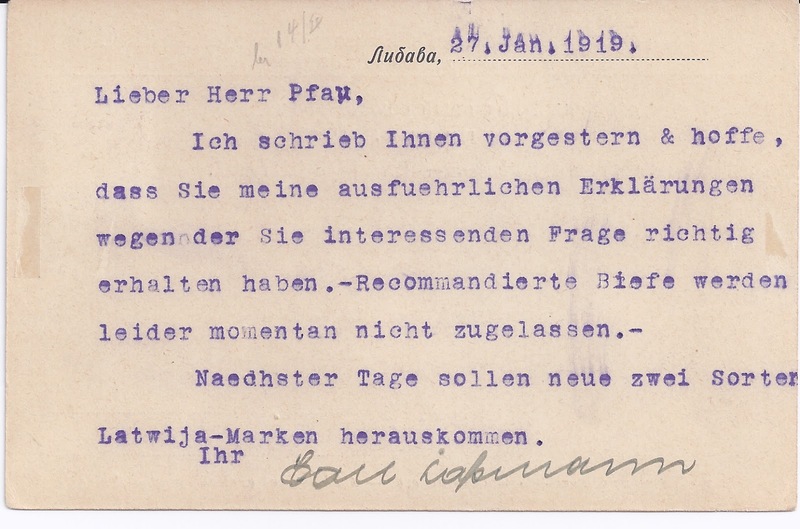 The typed message on the 27 January 1919 card from Leepaja says two interesting things: first, that for the moment Registered letters are not accepted; second, that in the next few days, two new Latvian stamps will be issued. That could refer to the first 10 and 15 kopeck Sun stamps, printed in Liepaja. 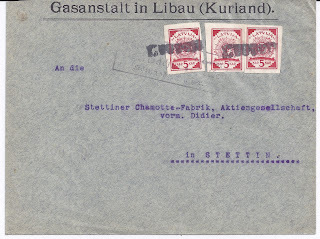 The dating of the card also helps date the period of use of the provisional Liepaja cancel. 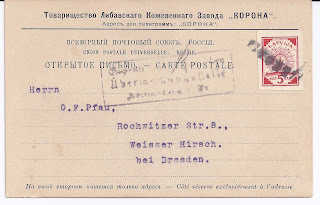 The second card is sent from Jelgawa. 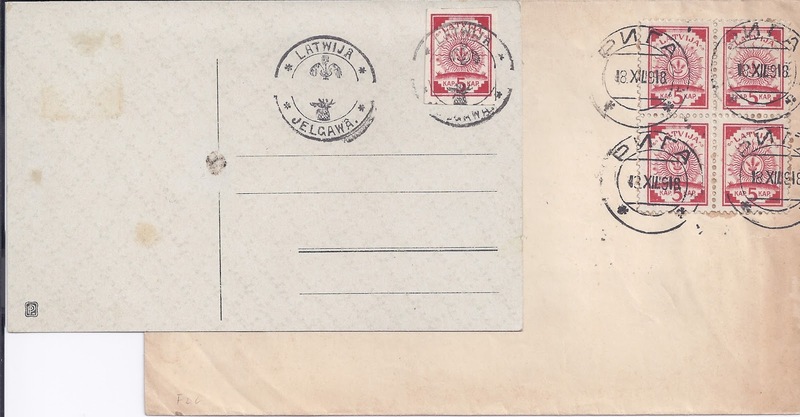 The card is dated 6 January - just after the arrival of the Latvian government in Jelgawa - and the postmark the same. Unlike the version on the unaddressed card at the top of this Blog, the provisional Jelgawa cancel now has a date line. 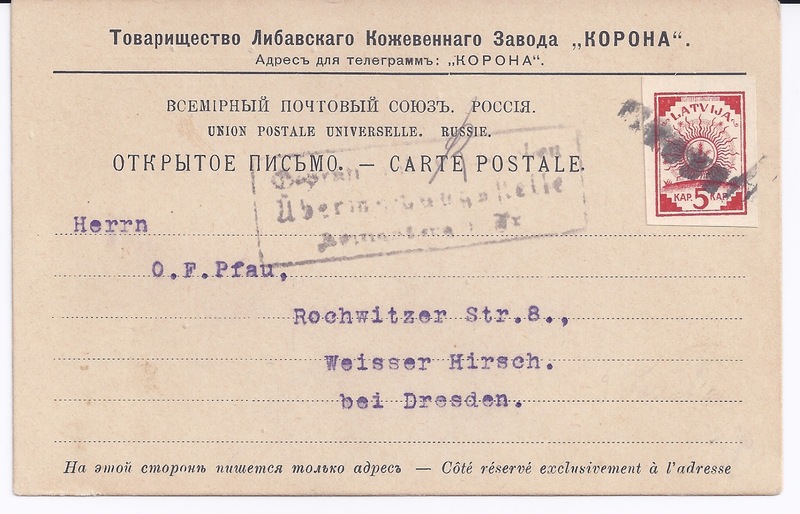 The Imperial stationery card has been used as a Blank, with German "Postkarte" (not Latvian "Pastkarte") written across the top. The arrow is just a bit of collector vandalism as may also be the case for the "III" written in ink to the left of it. Unfortunate, because this is undoubtedly a rare item. 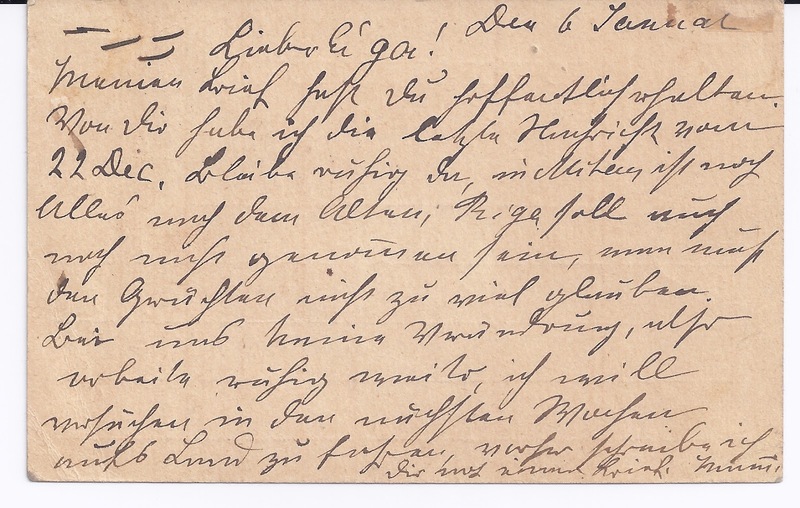 I can't read the message on the back - it's been written in a hurry and in one of those German scripts which are now baffling. 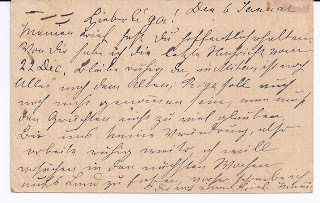 Any attempts at translation by readers are most welcome! 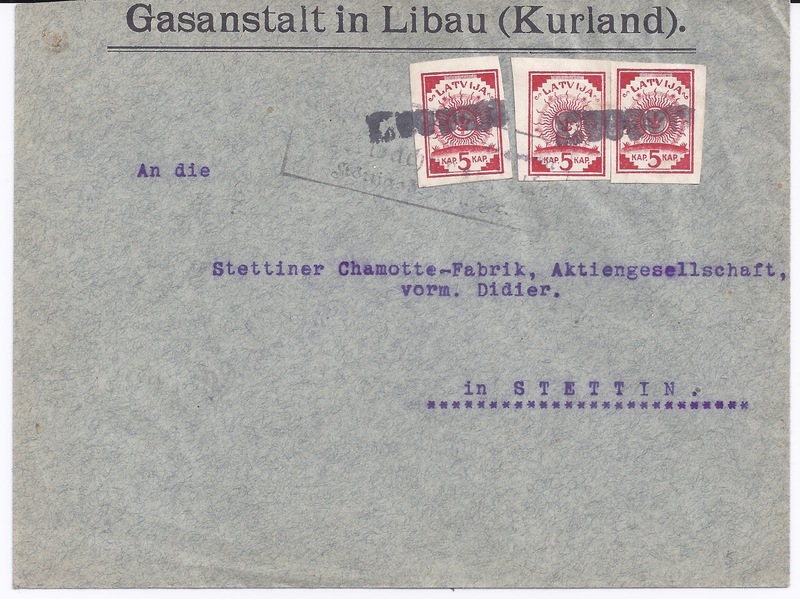 In summary: For postal use of Map stamps look for 5 and 15 kopeck frankings and look for December 1918 and January 1919. Mail to Germany usually has proof of transit through Königsberg even if there is no arrival mark on mail (which is likely to be unregistered). "Roughly Opened" - That's Good News! When Is a Stamp Issue a Stamp Issue?